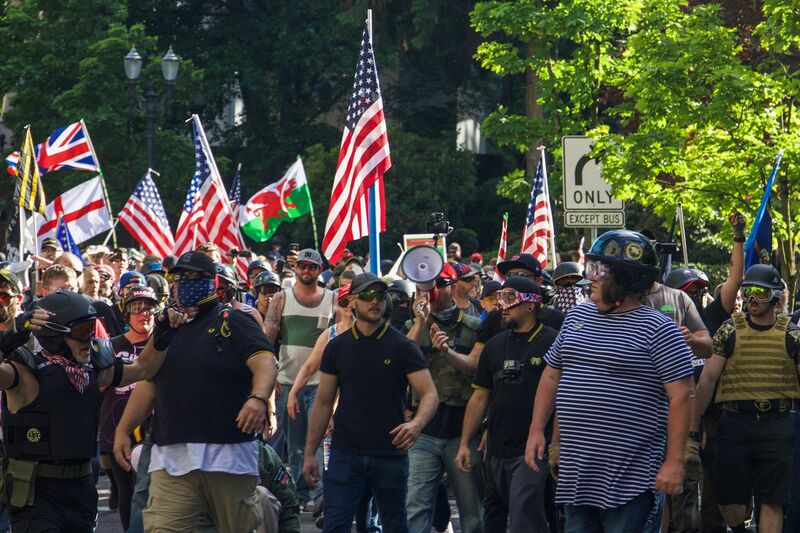 The first line of Proud Boys and members of the group Patriot Prayer walk toward antifa’s "black bloc," who wear black clothing to conceal their identities. Nov. 17 is National Take a Hike Day, and that's exactly what an organizer of a "pro-Trump, pro-America" rally says he'll ask racists to do instead of coming to Philadelphia that day. Zach Rehl, who runs the Sports Beer and Politics blog and Facebook page, said the "We the People" rally he's helping to stage at Washington Square at 11 a.m. that Saturday is simply to support conservative causes. Support for Trump slipping in rural America? Social media posts by a group known as the PushBack Campaign earlier claimed that "far-right groups with ties to Neo-Nazis known as the 'Proud Boys' and the 'Three Percenters'" are behind the planned gathering, first reported by PhillyVoice. "First of all, it's not a rally for Proud Boys," Rehl, 33, said Wednesday. "We're not interested in having any racist groups there, and if we find them, we're going to remove them from the event. Philadelphia is a tough city, and we want to let them know there's people here with different opinions. There's people who love the Constitution and people who don't." Washington Square falls under the jurisdiction of the National Park Service. According to public affairs officer Adam Duncan, the Park Service has "received both an informal inquiry and a formal application for a rally on that date, but 'We the People' is not mentioned and the location requested is not Washington Square." He would provide no other details. Several Pennsylvania-based Proud Boys groups did not immediately return requests for comment Wednesday, nor did the PushBack Campaign nor the group Philly Antifa. In its online post, however, PushBack wrote, "There is safety in numbers, so to ensure the protection of vulnerable individuals and communities, it is imperative that as many people as possible show up in opposition." It urged "friends and neighbors" to attend with "noise makers, signs, water, warm clothing and comfortable shoes." A Facebook page for the "We the People" rally said it was being hosted by "Patriot Events in conjunction with Sports Beer and Politics." "To many times our voices are drowned out by the voices on the left. We need to be louder, we need to be stronger. We will let them know that their violent tactics will not keep us down or scare us away," the page read. The rally, according to the Facebook page, is intended for "Patriots, Militia, 3%, constitution loving Americans, pro good cop, pro ICE, pro law and order, pro life, pro American value, pro gun and anti illegal immigration…." The Proud Boys, mostly white men with beards and Fred Perry polo shirts, made news this month in New York City after they brawled with anti-fascist groups following a speech by founder Gavin McInnes. The Southern Poverty Law Center described the Proud Boys' ideology as "general hate," claiming that McInnes, a co-founder of Vice Media, says they are a fraternal group that stands against political correctness and white guilt. Identity Evropa, a group the SPLC labels as "white nationalist," is often active in Philadelphia, putting stickers on telephone poles and occasionally cleaning city parks. Members, according to the SPLC, describe themselves as "identitarians" out to preserve Western culture. An Identity Evropa spokesman did not immediately return a request for comment Wednesday.